What makes an entrepreneur successful? I get to see and hear it all. ‘Oh, if I could just get organized, I would be dangerous!’. ‘I’m going to do it this year, I promise!’. I spent $5000 on this course learning how to do it, so I will now DO IT!’ But really all I eventually hear is: I’ll get to it later. 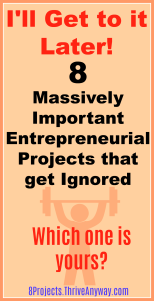 That’s why I am listing the 8 Massively Important Entrepreneurial projects that get ignored. Because below are some of the heavyweights in your business that often get treated as unimportant right now and get swept under the rug until ‘someday’. Truth is, most projects never get completed. By the time some entrepreneurs get ready to tackle a long-desired project, things change, trends change and they have to start back at square one to be up to date.